Lentil soups are my staple meal since I rarely eat meat and I need to get protein from other sources. 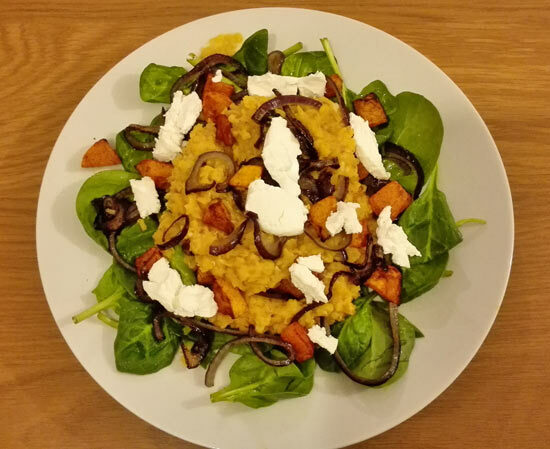 I used to make red lentil and carrot soup every week until I kind of got bored of it. I now always like to experiment by adding different types of vegetables to my lentil soups. 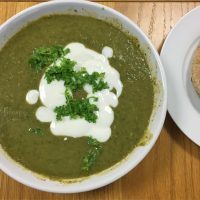 Not long ago I made a red lentil soup with sweet potato and spinach, which was great, but this time I decided to make it with courgettes and spinach. Heat up the oil, add the chopped red onion and fry on a medium heat for a few minutes. Add chopped garlic, quickly stir and leave to cook for a minute or so before adding red lentils. Add stock cube and enough hot water to cover lentils which you need to cook for at least 20 minutes. Add celery and chopped carrot and leave to cook for 5-10 minutes. This is added first as they take the longest to cook. After that add chopped courgette. While lentils are cooking they will quickly absorb water so you need to add more water when needed. 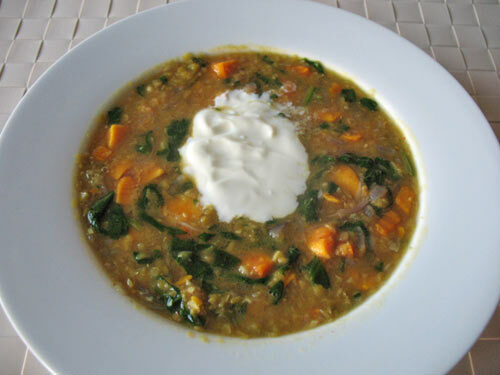 Add washed spinach towards the end when the soup is almost ready as spinach takes only a minute or two to cook. Optional: to make this soup a little bit more interesting, experiment with spices - you could add some turmeric, cumin and even chilli flakes. Serve with a slice of wholewheat or spelt bread and add a dash of lemon to help body absorb more iron. I really loved this lentil soup. 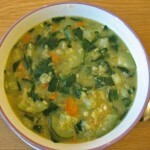 Spinach and courgettes go so well with it and it was especially so tasty because I used bunched spinach. Try and get organic bunched spinach if you can. It really tastes different.